This photo crossed my screen recently. I apologize in advance because I didn't properly record the source and I will give credit if someone helps me. I've spent hours trying to locate it again. In any case it is a stop, look and love photo. I am drawn to the simplicity of the design, the woodworking and the incorporating of the wall into the design. It is just such a strong geometrical zig zag statement. 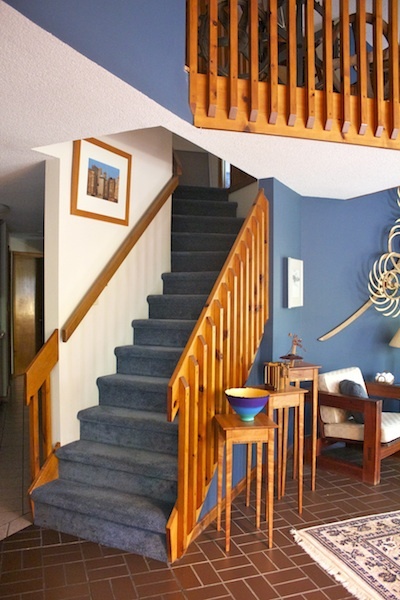 I always wanted our stairs to be noteworthy and when we built our house in 1978 I tried. But alias funding and building codes intervened. I did design a 45 degree angle into our stairs and it nearly took an act of Congress to get that approved by the local building commission. Here are the stairs in our home. Notice the 45 degree turn part way up. But between the hand railing codes and the required distance between uprights any hope for a sleek, contemporary design were lost on the drawing board. Here is the view from another angle. 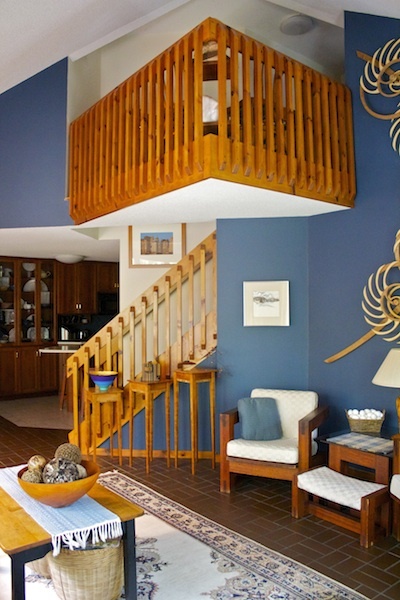 It all leads up to the balcony and the upstairs bedrooms. Over the next couple of days I am going to share with you other stair designs that give me pause. I dream of a redesign although on a limited scale because the underside of the stairs is part of the walk-in closet in the master bedroom. Great closets are more important than great stairs! Does anyone know how one gets creative stairs through building committees? Wheels in the House? Oh Yeah!